Coastal towns and counties have addressed on the local level managing navigable waters through ordinances that typically grant authority to remove derelict and abandoned vessels and other debris. The state does not have a formal program or legislation to regulate the removal or disposal of abandoned and derelict vessels, according to the National Oceanic Atmospheric Administration’s marine debris program, but there are laws allowing for a person to obtain ownership over abandoned vehicles, including vessels. There is a general statute, 153A-132, that gives coastal-area counties the authority, by ordinance, to prohibit the abandonment of vessels in navigable waters within the county’s ordinance-making jurisdiction, and essentially treat abandoned vessels in the same manner as abandoned and junked cars. The state first granted Dare and Brunswick counties the authority in 2013 to address abandoned vessels. The general statute was amended in 2015 to include all coastal-area counties: Beaufort, Bertie, Brunswick, Camden, Carteret, Chowan, Craven, Currituck, Dare, Gates, Hertford, Hyde, New Hanover, Onslow, Pamlico, Pasquotank, Pender, Perquimans, Tyrrell, and Washington. 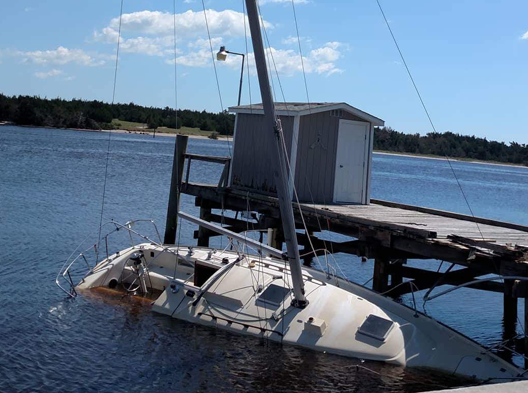 Hyde County Board of Commissioners passed earlier this year an ordinance prohibiting abandonment of vessels in Ocracoke’s Silver Lake and Currituck County board of commissioners adopted in July 2016 an ordinance prohibiting the abandoning vessels in navigable waters. In 1981, the state General Assembly authorized Beaufort, in Carteret County, to regulate navigable waters within its boundaries. 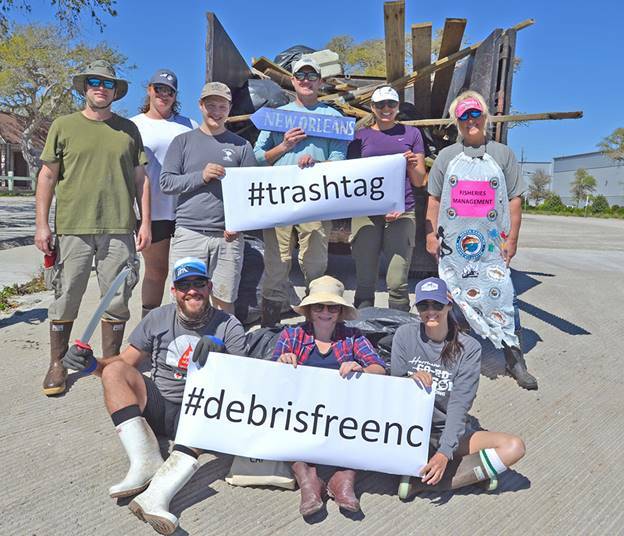 In September of this year, the Beaufort Board of Commissioners approved an ordinance to remove debris from waters in the town’s jurisdiction. Beaufort Mayor Rett Newton explained that the issue of boater accountability has been ongoing for decades in Beaufort, as well as in other coastal communities, which prompted the town to move forward with its navigable waters ordinance. Newton added that the town also received support from the much larger Beaufort boating community that he said abides by established boating laws and regulations. Between approval of the ordinance in late September and Monday morning, 123,958 pounds of debris have been disposed of, mostly from Taylor’s Creek. The total included 11 vessels, seven of which were partially or fully submerged, 34 boat moorings, or unpermitted permanent anchors, and seven car tires. “We still have one vessel and two large mounds of fishing net to be removed,” Day said, adding that those were expected to be removed next week. The Beaufort Police Department is responsible for enforcement of the ordinance and has worked closely with TowBoatUS to remove moorings and derelict vessels. “Beaufort (Police Department) also informed boat owners who were in violation of the ordinance of the new regulations — most complied by moving their boats from the regulated areas. Others relinquished ownership and their boats, which had little or no value, were removed and destroyed,” Day said. 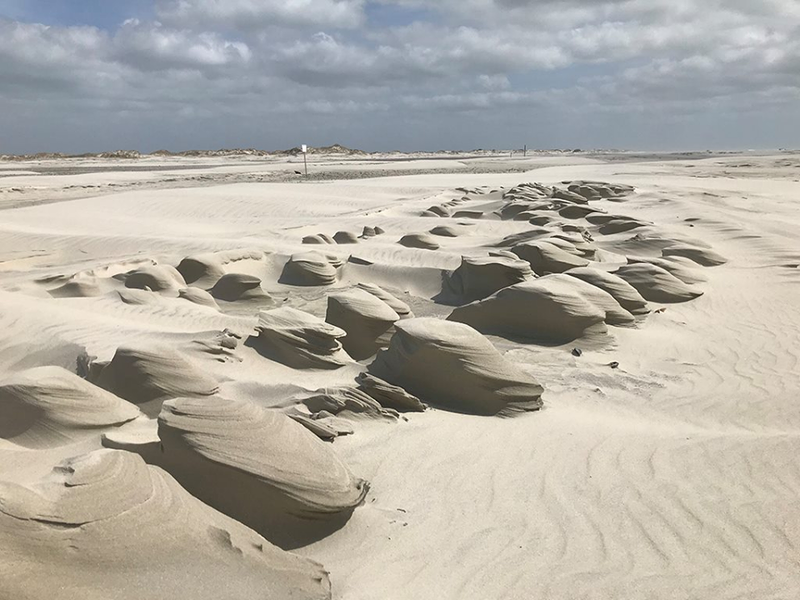 He added that three boats that washed ashore on the Rachel Carson Reserve were removed by the Coast Guard, which also removed all hazardous material, and TowBoatUS towed the vessels to be destroyed. 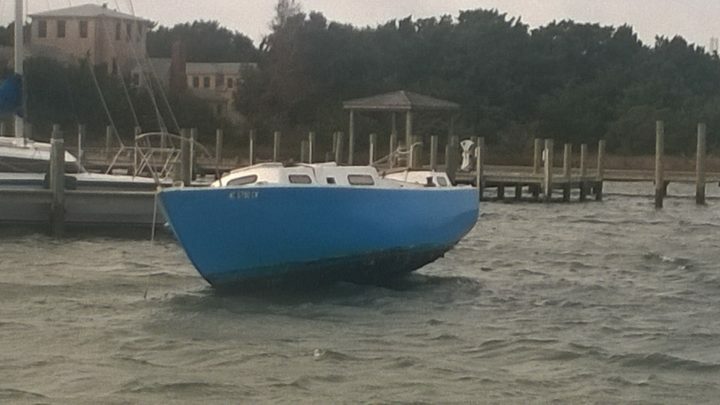 “Additionally, five boats were slammed into the Duke Marine Lab dock by Florence. Duke paid the town for the removal costs of the boats, and the town exercised its authority under the ordinance to remove and dispose of the boats,” he said. Wrightsville Beach has in place an ordinance, “Abandoned Vessel Unlawful; Removal Authorized,” which states “A. It shall be unlawful for the registered owner or person entitled to possession of a vessel to cause or allow such vessel to be abandoned as the term is defined herein. B. Upon investigation, the authorized town official may determine that a vessel is an abandoned vessel and order the vessel removed.” The ordinance was passed in October 2002 and amended August 2011. Wrightsville Beach Town Manager Timothy Owens said that the New Hanover County town rarely had to deal with abandoned and derelict vessels until this year. Owens said he couldn’t explain what changed. Unoccupied, anchored vessels are more common in the summer months. “The town is looking to strengthen its current ordinances and work with other governmental agencies that may have some jurisdiction,” Owens said. In the nearly six years Owens has worked for the town, most removals have been voluntary, once the owner was contacted or citations written, he added. Currituck County Manager Daniel F. Scanlon said that over the past couple of years, Currituck has dealt with about five abandoned vessels. Currituck’s ordinance was adopted to address enforcement and ultimately the county’s right to mediate the issue and attempt to assess vessel owners, Scanlon said. Scanlon added that some of the challenges have been access, both physical and legal, Coastal Area Management Act, or CAMA, regulations and possible environmental impairments. Brunswick County put in place an ordinance early last year to manage abandoned and derelict vessels. Capt. Mose Highsmith with the Brunswick County Sheriff’s Office said that when the ordinance was enacted 22 vessels were documented and tagged. He explained that of those vessels, 14 were removed by the owners, three by the Brunswick County Sheriff’s Office and two by commercial salvage companies. One could not be removed, but was demolished in place by a commercial salvage company to eliminate any hazard to navigation. The remaining two vessels were large shrimp boats that were too costly to remove. There are a handful of situations that would warrant boats to be tagged and monitored: if the boat is anchored or moored in the waterways for 10 days or more; is within 75 feet of another vessel; is aground, capsized, sinking or sunk or in danger of the previous; and if the vessel appears to be neglected and unfit to be used for navigation as intended. Vessels will also be tagged and monitored when not displaying a Coast Guard-approved anchor light while at anchor after sunset or a valid state registration or Coast Guard-documented number. Highsmith said that in the year and a half since the ordinance was put in place, the number of abandoned and derelict boats has been substantially reduced. “The process to get an ordinance enacted and a fully functioning program in place is challenging. There was a substantial financial commitment by the county manager and commissioners to remove a number of boats so that owners were convinced that we were serious. Maintenance of the program, however, is extremely reasonable,” Highsmith said. 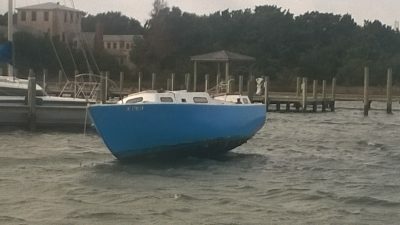 “Boat owners are now aware or quickly learn that mooring and leaving boats unattended is no longer an acceptable practice,” he said, adding that communication between vessel owners and maritime law enforcement, including the county sheriff’s office, Marine Fisheries and the Coast Guard, and compliance have greatly improved. During hurricanes, owners tend to seek safe harbor for the vessels in a protected anchorage, Highsmith explained, adding that there was an in increase in mooring in the creek adjacent to Fish Factory Road during Florence though most of the vessels moored for the storm were removed immediately after the storm. “Two vessels remain unattended and we are following the ordinance to monitor and encourage the owners to remove the vessels,” said Highsmith. 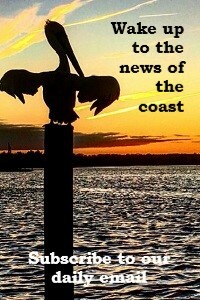 The Lockwood Folly River was a safe harbor for many commercial fishing vessels during the storm. All of them were removed and returned to their docks when it was safe to navigate. “Only one vessel, which was a private cabin vessel, sunk while at its mooring on the side of the river. Brunswick County Sheriff’s Office is in communication with the owner to resolve this situation,” Highsmith said. He said several steps must be taken before a vessel may be relocated, starting with giving the owner 10 days to respond with a plan to repair or remove the vessel after the boat has been posted as a derelict vessel or a vessel in danger of sinking. The owner then has 20 days to move forward with the plan and complete removal. If there’s no response from the owner or the removal or repair is not completed within 30 days of initial posting, the boat will be tagged and documented as abandoned. Attempts to contact the owner are made by phone, delivering or posting a notice at the owner’s residence, and certified mail by Brunswick County Sheriff’s office Marine Patrol. If all attempts to contact the owner are unsuccessful, the vessel will be deemed abandoned and sold at public auction. The highest bidder is presented a sheriff’s bill of sale that can be presented to the North Carolina Wildlife Division to enable them to register the vessel.